Mark Bradac has been in the pawnshop business a long time. How long you ask? 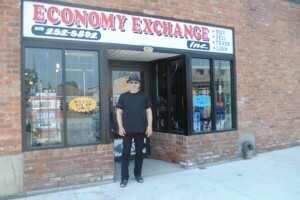 Mark’s father started Economy Exchange Pawn Shop in 1967. The original second hand shop was located in the Windsor Arena. In 1969, they moved to the current location at 857 Wyandotte St. E.
According to Bradac his dad would leave him to fend for himself in the store dealing with all sorts of characters when he was just a youngster. Last year, Bradac received a phone call from a Toronto based television production company. They said they were considering doing a Canadian reality based show with a theme similar to Pawn Stars in the U.S. After a brief conversation the company asked to come to Windsor to audition Bradac. Several months later, Bradac was invited to Toronto to take part in the filming of a reality based show call Pawn-a-thon Canada. When he got to Hogtown he was surprised to learn the TV company had hired a crew of 200 and built a real pawnshop in a movie studio. Bradac says the premise is kind of like Antiques Roadshow. People would come into the staging area, they would tell the experts the story about the trinket, and then if they were interested in selling the piece they would be taken over to the five pawn masters as they were known. Bradac spent four days shooting the series, twelve hours a day. He says he got to see some pretty amazing stuff including a pair of boots from KISS bassist Gene Simmons. Pawn-a-thon will air on the History Channel in mid-July and as we get closer to the air date I’ll share some more of Mark’s experiences with the show.